I distinctly remember the feeling of unwrapping and loading up Square Enix’s Final Fantasy Tactics on my Playstation as a kid, unsure of exactly what it was, but I knew it had something to do with the Final Fantasy series and it was enough for me. I was, to say the least, confused and disappointed for the first couple hours of the game. 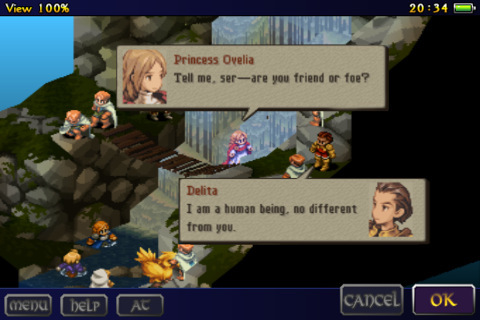 But I got used to it and ended up purchasing it again on PSP and yet again on iOS as Final Fantasy Tactics: The War of the Lions [$15.99]. I had the same feeling loading up the iOS version as I did the first time on PS1 — puzzled and unsure of exactly what to think about it. First, a quick primer for those who haven’t been following along at home since 1998: Final Fantasy Tactics was originally released for Playstation and created by most of the team behind the Super Nintendo classic, Ogre Battle. It was the first of what would end up being a billion Final Fantasy offshoot titles and subsequently, for a confused sixteen-year-old consumer, a strange, turn-based strategy version of Final Fantasy. It has since spawned a Gameboy Advance version, a DS sequel and finally, a PSP remake of the original, with the added War of the Lions subtitle. The PSP version is the one ported over to the iOS. It is often cited as one of the best turn-based strategy games in existence for its complex RPG elements, intelligent AI and its labyrinth of tactical options. Gameplay wise, you’ll be taking over a squad of characters and battling on grid-based maps in a turn-based system. As you play through, you’ll be able to level up your characters, equip weapons and effects and change jobs. Since the iOS port is based on the PSP version, you’ll also get an updated story, a better translation than the PS1 version and a few fancy cutscenes. For those who haven’t played it, that’s really all you need to know walking in as there are plenty of reviews that go in-depth into the game’s systems out there. If you’re already a fan, you’re probably playing it right now, possibly still cursing under your breathe about the price point and the wide range of issues. Those issues can make or break the experience depending on how dedicated you are to getting something out of it. Your enjoyment is going to come based partially on which generation of device you own. On a 3GS, performance is incredibly sluggish and the tiny text can be difficult to read at times. It looks and plays better on an iPhone 4, but lacks dedicated retina support, so the text is still blurry and hard to read. You’ll likely still experience some slowdown during more complicated bits. Double-sized on an iPad is probably the smoothest experience, but if you’re going to do that you might as well hold off for the HD release this fall. Still, both the PS1 and PSP versions suffered from the exact same slowdown, so for those who played every iteration, it should come as no surprise Square Enix still hasn’t cleaned it up. As far as the touch implementation is concerned, it’s a mixed bag. The game features a rather horrendous user interface, accented by the fact everything is so small. It really could have benefited from redone or resized menu screens. The same goes with the newly added camera movement, which, although you can pinch and zoom and slide to move, it doesn’t feel like a lot of thought was put into it. Movement works about as well as you’d expect on the small screen, meaning you’ll occasionally be tapping the wrong square or hitting the wrong box. 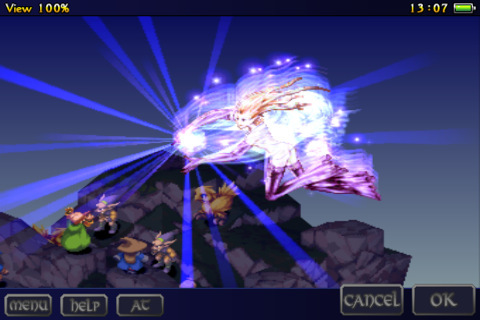 You’re also losing the multiplayer of the PSP version, which is only going to matter to a small group of people, but it’s a notable loss for anyone who wasted away hours in the ad-hoc wireless battles. That’s par for the course for nearly every aspect of the game. It’s a quick and dirty port of the four-year-old PSP version of the game, which itself was based on a thirteen-year-old Playstation game. For fans of the original, you’ll get pretty much the exact game you expect, albeit with some performance issues on some devices. If you haven’t played either of the previous versions, you’ll run into a steep learning curve, but you’ll be rewarded with a massive, complex game that happens to be in a crappy wrapper. 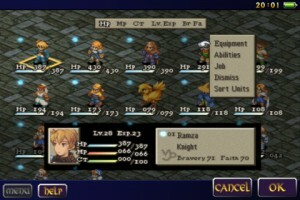 It would have been nice to get a truly iOS-optimized port, with redone menu screens and text, but no matter how you cut it, if Final Fantasy Tactics: War of the Lions on your phone is all you want, you’ll be able to deal with all the issues.